Packed to the limits with the best technologies Apple has to offer, the iPhone 7 Plus will prove to be a cracker of a phone. Sporting a classy black finish and a simple yet stylish design, this device looks as good as it performs. It runs on the new and powerful iOS 10 operating system, which provides a hassle free user experience by incorporating its awesomeness in every aspect of the phone. 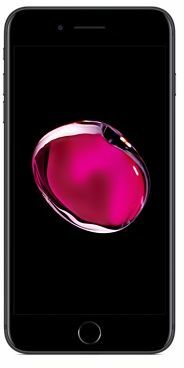 An advanced A10 Fusion chip powers the iPhone 7 Plus, and is capable of handling everything you throw at it. It also offers good battery management features and delivers up to 1 hour more of charge time as compared to the previous iPhone 6s Plus. With an advanced, rear 12MP dual camera system, you can shoot lifelike and delightful photos of what you love. These pictures can be viewed in all their beauty on the 5.5inch Retina HD LED backlight IPS display that offers an enhanced visual experience. To satisfy all your data and multimedia storage needs, the iPhone 7 Plus provides you with a massive storage space of up to 128GB. With 4G LTE and WiFi networks, you can easily stay connected with family and friends from anywhere. The iPhone 7 Plus has something that you won’t find in other iPhone models. It incorporates two stereo speakers.Also, the phone is Rated IP67 under IEC standard 60529, which makes it resistant to water and dust. Constructed with the incredibly durable 7000 Series aluminum, the Apple iPhone 7 Plus is thinner and stronger. It is just 7.3mm thick and weighs 188g. One major lookout in the iPhone 7 Plus is its IP67 certification that makes it resistant to spills, splashes, and even dust. It also incorporates a customizable Home button with new Taptic Engine to give you precise tactile feedback as you press. Plus, the Touch ID built into the Home button makes unlocking faster and lets you pay instantly and securely in stores and on the Web. Regarded as the brightest and most colorful iPhone display yet by Apple; the 5.5inch Retina HD LED backlit widescreen display is noticeably more vibrant and crisp. This Retina HD display delivers 25 percent brighter colors, a wide color gamut, and the best color management in the smartphone industry. It introduces a more powerful and responsive 3D Touch, which lets you interact with various apps effortlessly. The release of iPhone 7 Plus changed the game for every smartphone in the market as it also incorporates the powerful A10 Fusion chip. It is not just faster than any previous iPhone but also more efficient. The chip uses an all new four core design with two high performance cores and two high efficiency cores that deliver the best performance when you need it. Plus, with the A10 Fusion Chip, you’ll get up to one more hour of charge on iPhone 7 Plus than the previous generation model. Designed from scratch with an all new design and features, iOS 10 is one of the world’s most advanced mobile operating system. It lends life to your device in smarter ways than ever. According to Apple, this OS is more personal, powerful, and playful. It puts privacy first, makes shopping online faster and safer, provides a more refined search engine, and offers a smarter Home app. Plus, it also adds a personal touch to notifications, iMessage app, Siri, Maps, and Music player. The one thing you won’t find in other Apple iPhone specs is the incorporation of the 12MP wide angle and telephoto rear camera that is exclusive to the iPhone 7 Plus. The dual camera system and exceptional ISP technology get you sharp close up pictures and videos with a 2x optical zoom and an improved digital zoom that lets you shoot at up to 10x for photos and 6x for video. What’s unique about the iPhone 7 Plus is its support for FaceTime video calling through the FaceTime HD 7MP camera. This front camera supports 1080p HD video shooting and Retina Flash along with many more features. 96.8% of users recommend this product to a friend. Very fast delivery * I have one doubt, Why the packing not covered by plastic as original packaging, Just sealed by Souq.com Sticker? the phone might be overpriced a little bit but its really worth it. its camera is one of the best camera's right now. and of course one of the fastest phones. can handle all games easily. decent full hd screen. amazing battery life that can last up to 2 days if normal usage. Thanks souq.com for early delivery. The best and fast..!!! Got delivered in 5 hours... !! !